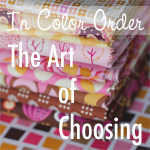 I'll be posting this week's Art of Choosing topic tomorrow or Wednesday, but before we dive into putting together color schemes, I wanted to wrap up the first half of the series. Have you been following along? How does your stash look? I'd love to see photos of your newly organized stashes! I'll be sharing them here on the blog later this week! Leave a link to your flickr photo or blog photo of your stash! If you don't have a blog or flickr, no worries, just send it to me in an email along with your name! I got my stash under control using comic book boards. It is so easy to find my fabric now and know what colors I'm missing! My stash is definitely looking better! Not perfect but waaaaaay better. Thank you! I've really enjoyed this series, it's been some great eye candy, not to mention some great stash advice! I've reorganized my stash a bit, too, and it feels really good to know what I have and to be able to find things so much more readily! Thank you for the help and inspiration! well I havent done much with this yet. But when there was a sale from a LQS that went out of business I kept in mind your tone on tone and white suggestions.